I've now reached the really hard bit, making a decision on how to approach the rules for this game. What sort of game do I want to play? Am I comfortable with my answer? Why? Why not? There is no right answer to these questions anymore than there is a right answer to the favorite colour question other than it being an honest answer. Luckily there is no suspension bridge involved in this quest. The Jaeger officer now has something approximating very roughly to a matching hat so that priming may begin. This picture nearly resulted in my tablet being smashed into little frustrated bits when it refused to acknowledge the presence of the picture file for editing or posting although it would show under Bluetooth in the file app. GRRRRR. I finally posted it from my smartphone without cropping but with firceful application of the Blue Air app. The initial steps were easy enough, I wanted a simple, fast playing game of toy soldiers which would call to mind warfare of the early 20th Century without getting bogged down in detail. I did not want a game that attempted to replicate the experience of captains and privates, showed the details of their tactics or attempted to to inflict on a player a sense of the alternating terror and boredom of being pinned down under fire for hours on a hot summer day. I wanted the player to take the role of a Brigadier, or possibly a division commander, trying to achieve a mission with the resources at his disposal while pitting wits against his game opponent. It didn't take long to hit two snags: lack of information and a conflict with past gaming experience and expectations. Memoirs and histories giving the Brigade commander's view aren't common but for the Horse and Musket period they aren't that rare. Memoirs at this level often have a poitical purpose but are still useful if taken with salt. The American Civil war is particularly rich with them. The smaller wars of the period also provide many important battles at this low level which have had books devoted to them, battles that would be dismissed with a sentence if they were part of a larger campaign. I am sure some memoirs at this level must exist for the Boer War and Great War but I have yet to lay hands on them as opposed to the view point of privates and junior officers. I have tracked down a few sketchy histories of smaller battles which were part of a larger one but not any in great depth as yet. There is good coverage of the larger battles from which subportions can be extracted but there the choices available to a Brigadier are too limited to be the basis of the sort of game I want so as so often I will focus on the sideshows and special cases and enjoy the hunt for information at a leisurely pace. Having decided that I have enough of a picture to proceed I have run smack dab into a wall of prior expectations about how modern games should be handled on the table top. One of the first things that one learns about modern war is that troops under fire are often pinned down. There seem to be 2 main methods of portraying this in a wargame, having it as a combat result or as the result of a failed morale test after suffering casualties. The trick with the latter method is it while troops were sometimes caught and suffered heavy casualties before being pinned, it seems very common that troops that came under fire took cover before heavy casualties were suffered but were pinned by the fear of what would happen if they left their cover. The method of having some form of Pin or Suppression as a combat result works well enough except that it often mirrors life too well with players rolling turn after turn to rally only to be pinned again as soon as they do. At Magerfontein some British troops were pinned down for hours, not taking heavy casualties (until they retreated) but unable to advance. That's not a game that I am eager to play. It occurred to me belatedly that this emphasis on showing the pins is as a result of a focus on small units and individuals. In the days before widespread wireless comms, the Brigadier would be unlikely to know the status of individual companies. He would be lucky to know if the objective had been taken yet or if he needed to commit reserves. Oddly enough some early war games by veterans seem to have relied largely on the morale or wisdom of a player afraid to push his figures into certain death to dimulate this. When I first played Memoir and Battlecry it bugged me that units could be forced to retreat without casualties (ie morale failure in old terms on the surface) but there was no pin effect. Putting my less literal hat on and looking at the high level effect of this game mechanic I can see that the effect is actually reasonable. A unit under fire may be unable to advance on the target or hold an objective even if it doesn't take heavy casualties or it may take casualties or both, or if might push on and take the objective. We see game mechanics and the result, not really the details of what really happened or how it happened and thats without looking at the effect and fuzzy meaning of the cards. That Borg fellow is pretty smart when you come right down to it. There are other issues but this is long enough and the point is that after serious consideration, fiddling and experimenting with various old school and middle school methods, I'm going to stick with an updated version of the Square brigadier after all. Ok the title is just an excuse to include part of my first toy castle in a picture after having seen Bob's old castle re emerge from storage. 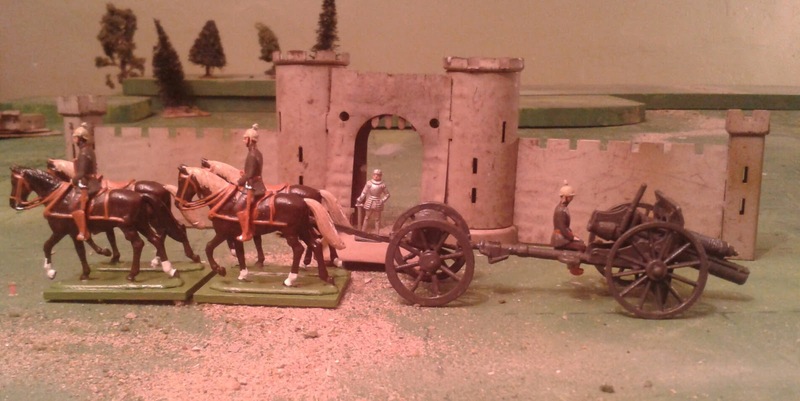 The newest unit rolls past my old tin plate castle with 1 of the 30mm knights I got at the same time. 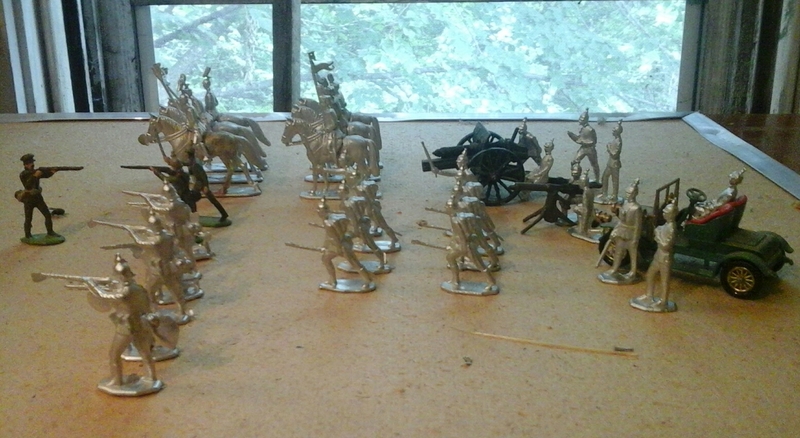 The crew and horses are Zinnbrigade, the gun is a Crescent 18pdr and the limber is a modified Prince August 18thC limber. I was tempted to leave the seated gunner loose and paint more for travel mode but my ecperiences with the FTC rocket troop dissuaded me. The real point is that, while preparing an old Crescent 18pdr for repainting in grey, it occurred to me that my recent enthusiasm for WWI figures and books and plan for a Centenary Homage game may have unintentionally given the impression that I might be on the cusp of reverting to being a bona fide historical miniature wargamer. Let me assure everyone that this is not the case, I remain a proponant of the Little Wars approach. Not the specific bit about shooting toy cannons but the general approach of studying history but playing a game with fictional armies of toy soldiers. Some Scruby Jaegers are up next. Don't you hate it when clichés apply? But before I begin, thank you all for the various book suggestions but a special thank you to Mad Padre Mike for suggesting Walter Bloem's The Advance from Mons 1914. This is my favorite sort of military history, an eye witness account by an observent, thinking person who knows his business and knows how to write. In this case he uses his skill as a prize winning novelist and playwright to give a real sense of the emotions and motivations of men as well as relating the what and how. At least one of his prewar Franco Prussian War novels was translated into English but it looks like it will take more than a casual search to turn up a copy. I suspect his post war politics may have discouraged interest in his work but I have nothing but praise for this book which repeatedly distracted me from work and play alike from downloading to completion. Highly recommended. Other books downloaded and scanned/ spot read but not yet studied are a battlefield guide to Mons with some very detailed maps and Spencer Jones book on the development of British tactics. After reading Jones' chapter on infantry tactics, about 1/2 of the battlefield guide and Bloem's book I'm feeling much more comfortable about my understanding of the battlefield and tactical aspects of the early war, which is to say everything so far has confirmed and backed up what I already thought. I've also realized that I've read more than I remembered as various snippets of books read long ago resurfaced to my consciousness. The new Brigade General steps down from his captured Renault to address the Hussars who have escorted him here. At the same time he looks around and contemplates how crowded his units are. Unfortunately, all this has confirmed my initial impression that I need to make some adjustments on the tabletop. I had been planning to work up to a Brigade attack on a grid of 15 x 18 squares, say 100 figures vs 50. Sitting down to cross reference rules with table I find that that as it stands the table would represent an area of 4-5 km wide by 3-4 km deep. OK for a brigade in the 2nd part of the Boer War but a suitable front for a divisional attack in 1914 or the first part of the Boer War. 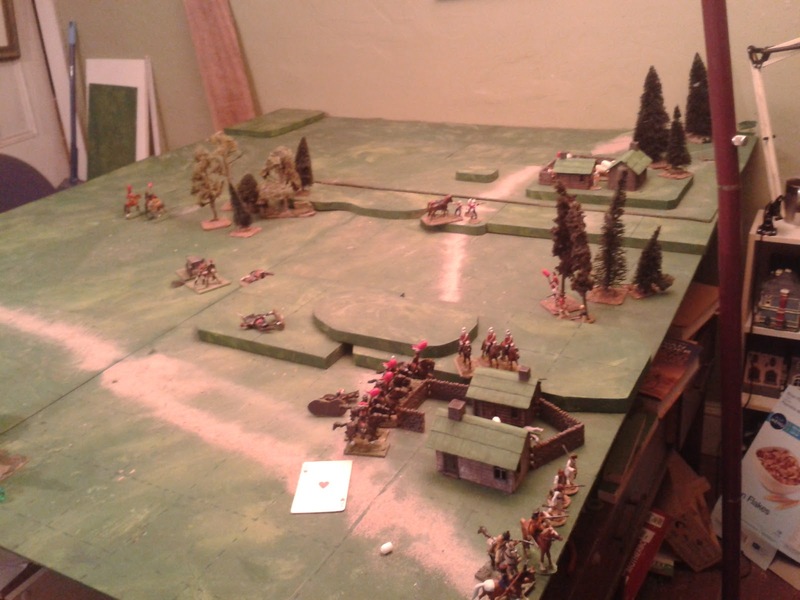 To resolve this, there were 3 main options: increase the scope of the game to a Divisional action, change the scale to 100 yds per square making units into sections or platoons, or use fewer grid squares. If I had gone with my initial impulse to make use of the many excellent 1/72 figures now available, both of the 1st two options would have been attractive. The 2nd option being ripe for a conventional wargame with 100's of figures on modular model railroad terrain. But I didn't take that route which is lucky for me because I hate doing model terrain and the approach has already been done by many, most of whom have done a better job than I would. Either option would work with my 40's so the deciding factor was that I don't really want to paint double or triple the numbers of the same figures or play longer games. I'd rather branch out into other campaigns and armies. So that left a reduction of the number of grid squares either by using bigger squares or by playing on one corner of the board. It seems a bit odd to plan to use only about 1/3 of the table for 90% of games but it would leave my options open. There is another issue to look at though, the look of the thing. Put simply, 4" squares are a tight squeeze for 40mm figures, especially when terrain is added although this could be eased by using semiflat trees and houses like the ruined corners that came with my Marx Over The Top mini-playset (or as featured on the Major General's site). Its next to impossible though to fit a limber in a 4" square even if using 2 squares per limbered battery or to fit my boats or most of my houses. Last night I broke out some of the various scraps of gridded cloth table mats from my experiments over the last 4 years. This allowed me to compare the fit of troops and terrrain on 4", 5" and 6" squares. 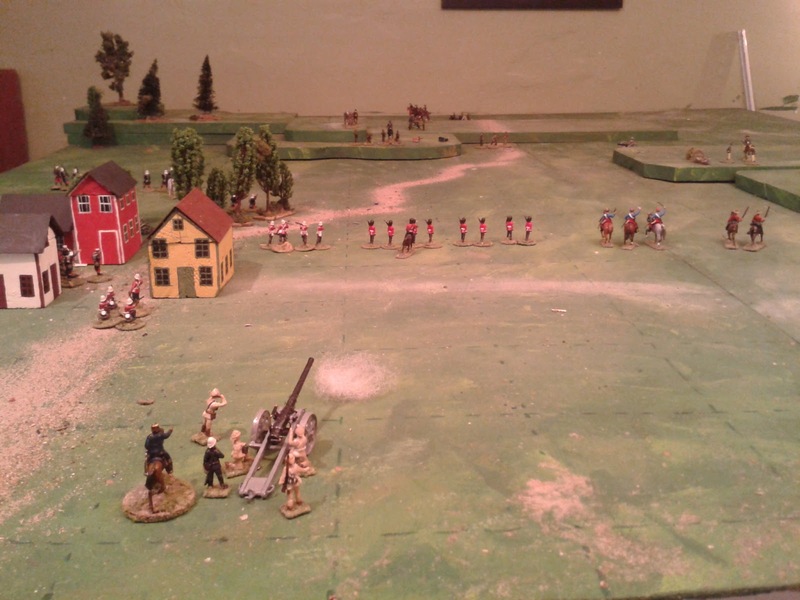 In the end the best one was the one I did for my first go at Bob Cordery's Portable Wargame in 2011. This was a cloth with 6" squares marked by solid lines but subdivided by a central cross into 3" square which could be used or ignored. Ding! Much better. Does it come full size? In green? If I applied this pattern, I could take my 1/72nd troops from their 10x12 grid to a 20x24 grid of 3" squares for an occasional big battle or use my 40's on a 10x12 grid of 6" squares which fit them comfortably. I could also share terrain items across tables. Since tabletop teasers have been shown to adapt well to a 10x12 grid, translated scenarios map could be used for either the portable or the permanent table. The 10 x 12 grid would also be about right for a Brigade attack in 1914. Thinking back to the pair of old books that I have turned to since I could first read, one was on the Boer War but the other was on the Great War. I've have been expecting for years to have to eventually put the Boer War on the table but I may just have been ambushed by the Great War while I wasn't looking. I wonder how my little toy train would look full of Turks, rolling across a desert? War is a horrible thing really, full of suffering, death and destruction. Every once in a while I forget briefly why we've decided that its an ok subject for games. However, I don't feel like writing about it tonight so instead I'll share some thoughts on what I'll be doing with my new shiny toys. 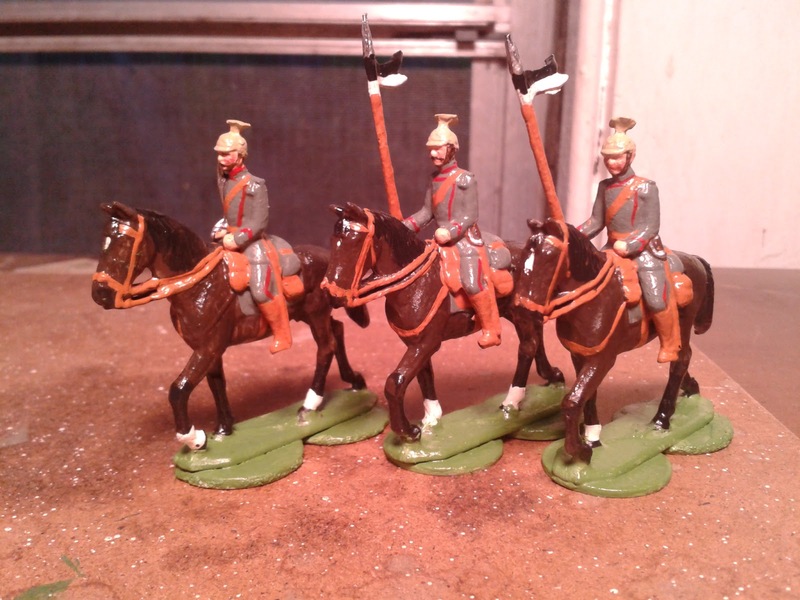 Zinnbrigade Homecast Uhlans converted from parade to service dress. (I found a short memoir by an English nurse in Belgium in 1914 which includes mention of the Prussian Uhlans riding into town with the pennants on their lances, so, I'm good on that score) . I haven't decided yet if I'm going to try to integrate the washers with the figures' bases but in the meantime they're stable. I need more books! Especially about the nuts and bolts of tactics at the company & battalion level in early 1914 and about the functioning of brigades. Most of the dozen or more books I've read over the years were largely collections of individual memories and letters, books on specific campaigns or high level overviews and summaries, and mostly on the Canadians or on non-Western Front campaigns. Since I don't want to have to paint lots of figures before starting this venture and don't want to track status on units or be making constant rolls to pin and rally while also tracking casualties, I'm looking at abstraction and compromise. The Nine Years War continues as the bigger table and revised rules are tested. For example, I was originally looking at each 4 figure unit as a company for my WWI game. If I really want it to be a company it should be able to take multiple hits, be pinned or forced back and yet keep fighting, possibly all day. Making 3 or 4 stands a company would make that easier but then I'd need 3-4 times the troops and more space. If instead I just call 3 or 4 stands a battalion and don't worry about lower details then as long as 1 stand still has a figure left, the battalion is still in action and so on. Another matter to consider is the grid size. My table expansion has given me a grid two and a quarter times the number of squares in my usual 120 square board. If I only field 12 to 20 stands then it will be a very empty field. The options are to increase force size, make the squares bigger or just use part of the board for some scenarios. For now the third option will do since it leaves the door open. Increased forces could be a possibility down the road, either more stands per battalion or more battalions as would a change of scene to a less crowded area, the desert perhaps or East Africa? But that is getting ahead of ourselves. Brigade staff group next I think then gunners and jaegers. After several days of getting bogged down in game design issues it was a relief to get back to work on figures today. 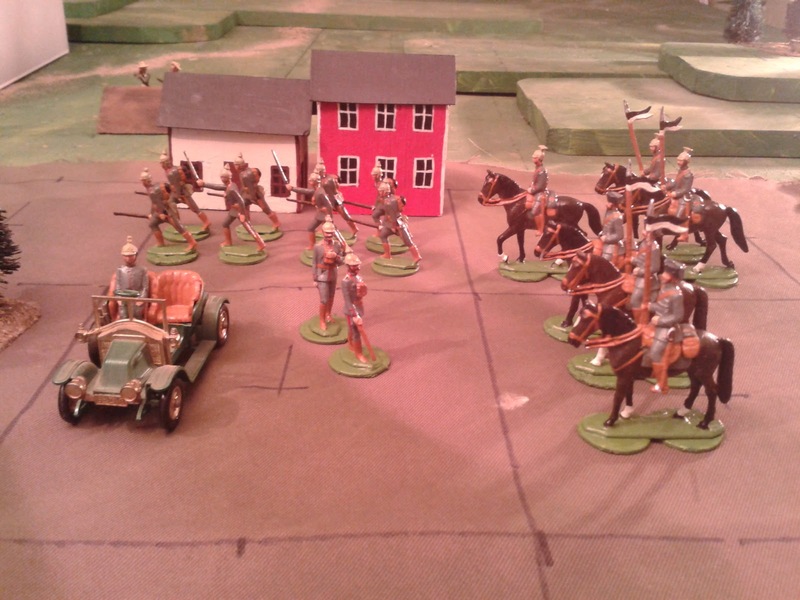 While I have an old Almark by Nash on WWI German Infantry, I had to turn to an early Funcken for a peek at Uhlans. 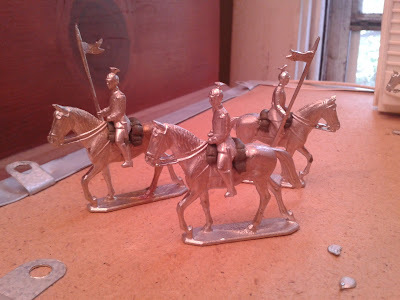 Since the Zinnbrigade molds are in 1900 parade gear, some minor modification was called for, even for toy soldiers. The first was easy enough, I chopped the falling horsehair plume from the caps. I suspect they didn't carry pennants into the field in 1914 but I like lance pennants so I didn't even check. Various pictures indicate that they should have a slung carbine but while I have carbines I could glue on, I suspect they would be forever getting knocked off so I opted to leave them out. That left the horses which had no valise or saddlebags. I could have gotten away with it but even Britain's added saddle bags and valises to their Boer War British cavalry and besides, the riders fit more securely when tucked in. A few minutes with epoxy putty sufficed. Tonight I primed them, tomorrow I'll start painting. I'll also get back to agonizing over how appropriate it would be to turn this into something akin to a parlour game as well as agonizing over what level of historical accuracy, detail and horror I wish to include. Uh Oh, That was fun. I should probably explain the New Style. 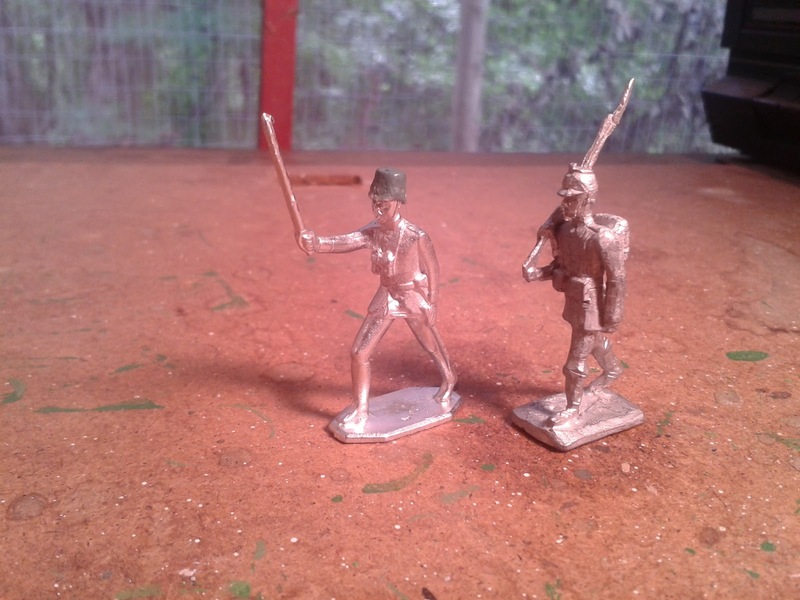 Put simply I like the look of the faux toy soldiers of the 1990's to the real thing of the 1890's. Figures by the like of Toy Army Workshop, Trophy, Imperial and Tradition (et al) are what really make me smile so without deliberate attempts to copy, that is the feel I go for these days. Field Grey to use the English term is a tough colour for me. The last actual tunic I saw was in the War Museum 30 or 40 years ago and at the time it struck me as much a much more brownish or drab shade of grey green than I expected (certainly compared to my factory painted Marx figures) but I have no idea now if that was a real one or a reproduction and anyway was long ago and far away. Trying to mix a colour that at least looks like photos on the net is what is stumping me. I keep getting a shade that is too cool for my liking. It doesn't help that the mix dries to a slightly different shade. However, after several tries I decided that having already all but obliterated all the faint belts on the these figures that this would be good enough. At least I know what colours went into it. I'd have been happier with a 2 pot mixture since that is easier to replicate easily but so be it. Yesterday I re-discovered some Scruby Jaegers that will be added and they'll need to be greygreen not field grey anyway. I had been leaning towards mounting the figures for this project on bases ala Morschauser for an nongridded game but after rereading some snippets of eye witness accounts it struck me that units seemed to fragment easily and things often got done by small parties working on their own and then there was that toy soldiery thing and my recent unorthadox experience (for me) of not having fixed units in my Privateer game and having that work well so I am leaning back towards a grid but possibly instead of fixed 4 man units, perhaps with 16 man battalions breaking down into groups of individuals as the battle goes on. Or not. In any case, I figured that as long as I was painting a number on the front of the helmet covers, I might as well use it to identify the 4 man company that they belong to rather than painting the same regimental number on 100 guys. Anyway, now that they are varnished I'm happy with these guys, its just that, well, I was planning to paint shiny colourful figures this year but I have a feeling that shiny drab figures are going to be flooding my table. Look out Jacklex, when the 1st War is over, the Boer War might just have gotten bigger again! August 4th is Approaching, Mouldalization has Begun! The "Great War" as it was once often called, was my grandfather's war. (And as John Hurt reminds us things can be terrible and still be great.) I am determined not to let the Centennial pass unremarked. The first thing that came to mind was a landscaped table full of 100's of 1/72nd figures but then I blinked and came back to reality. A smaller 1/72nd Square Brigadier game using Airfix WWI figures to celebrate their 50th Anniversary seemed the best and most logical choice. So that was out. 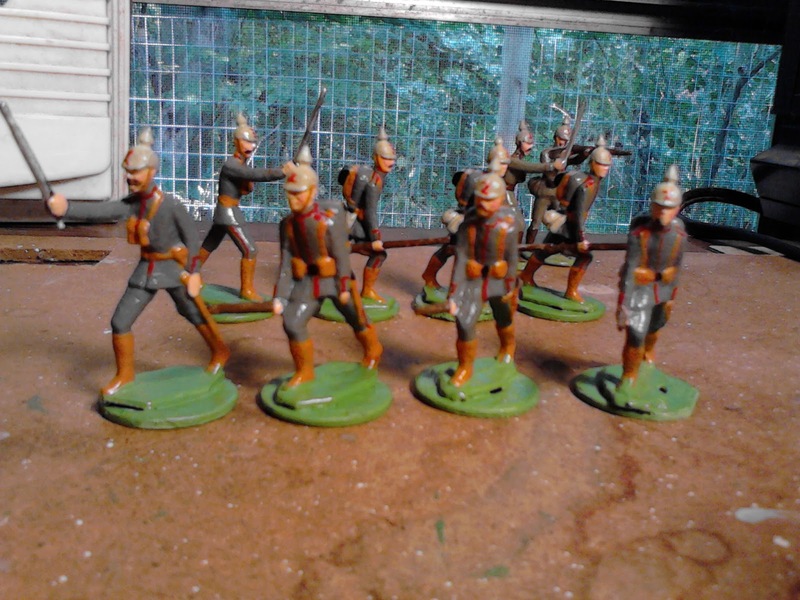 I have mentioned before that going through the war did not take the shine off my grandfather's Britain's toy soldiers so somehow that seemed to point to a way that is already before me, glossy homecast 40mm Toy Soldiers. It is perhaps a shame, or possibly given circumstances, lucky, that the Zinn Brigade figures are a smallish 40mm and not very comfortable when mixed with Irregular or Little Britons (update: having taken a few samples out of the cupboard the difference is less than I thought, more a matter of hat size than height) or even the old B and W ranges when one can lay hands on them but their 1900 Prussian molds make a good start for a toy German army for 1914. The perfectionist would modify them slightly but I'n going to use as many as possible straight out of the mold. The British will be more problematic and its not yet decided whether to do some new masters and make molds or just convert enough figures, one at a time. The prototypes, hurried up in 2012 and waiting ever since. The results of today's casting session. Looks pretty desperate for the BEF. Maybe I should deploy some zouaves? A Tiger by the Tail. An ACW affray. 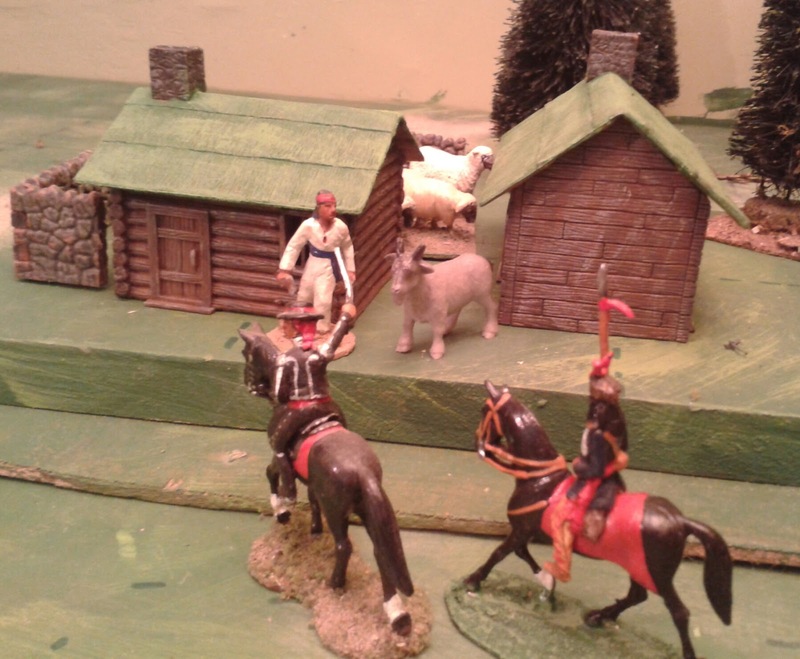 Sunday's game was loosely based on an historical battle which you are welcome to guess. 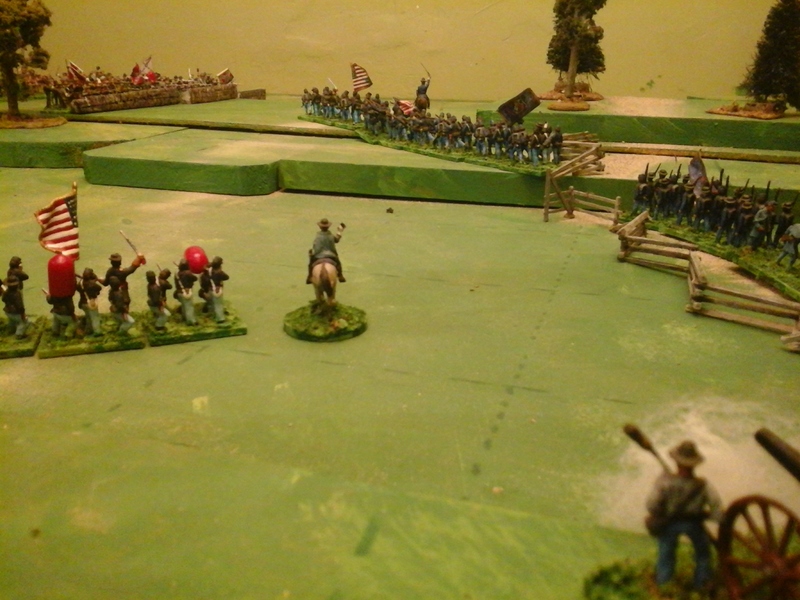 The Reb have caught up with a Yankee rearguard of a 4 regiment brigade and 2 batteries. They launch an attack by two brigades. Three average regiments supported by 5 elite ones and 3 batteries. 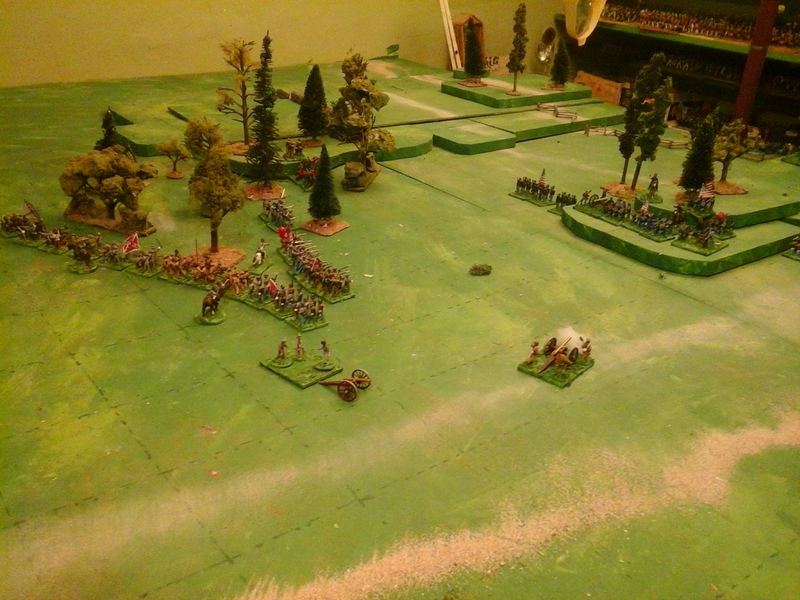 The attack took heavy casualties with little progress as did the original so like on the day I marched the Rebs by the flank to try to get inbetween the Yankees and their communications. Part way there it became obvious that there were more Yanks at hand. This is one of those historicsl battles that sound like a made up wargame scenario. Part way along the ridge was a stone wall which the Rebs managed to deploy behind just before the Yankee counter attack hit. 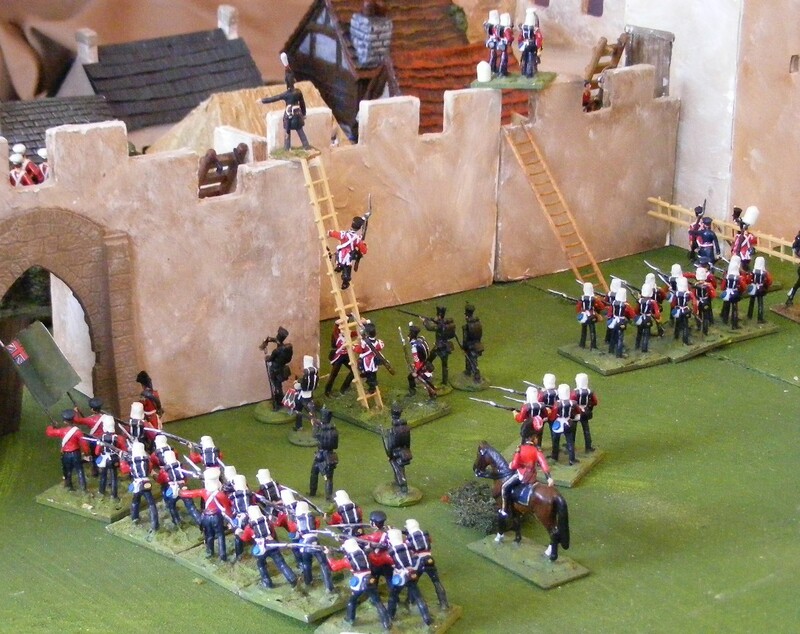 The first assault on the wall was a bit of a fiasco on the tabletop as was the original. The second go was not much better but then it settled into a firefight. 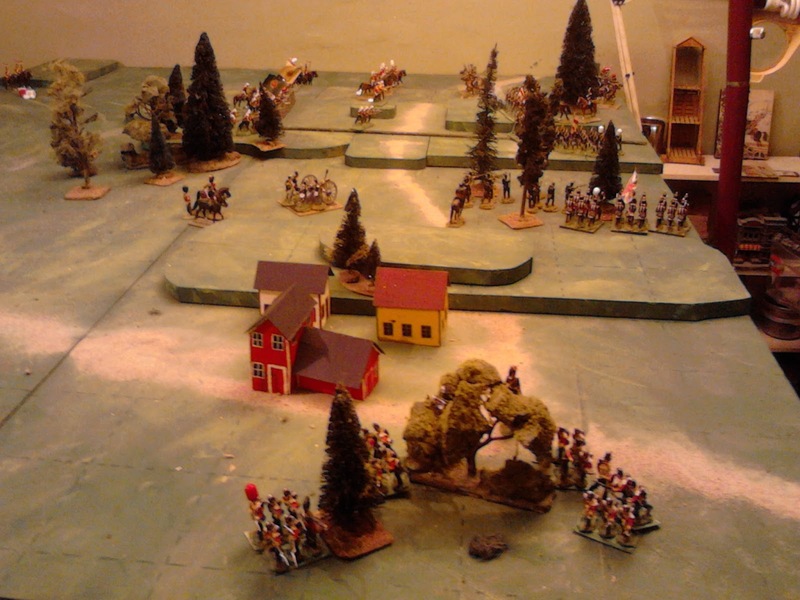 The Yanks made good use of their artillery superiority and brought up their first brigade to flank the rebs. The fighting in the woods was prolonged and bloody. 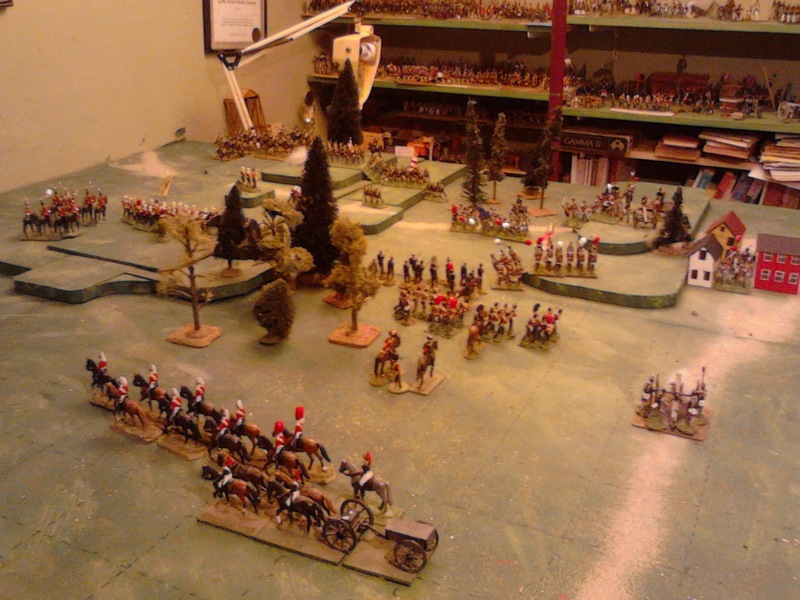 Eventually as casualties mounted, numbers told and the Rebs reached their 1/3 stands lost breakpoint and gave way. The Rebs had 3 fresh regiments in reserve while the Yankees had 5. Neither was committed but they were counted for the breakpoint which is what kept the Yanks going as they actually lost 1 stand more than the Rebs. For starters, throughout the game, following roughly the historical movements and attacks, I got roughly the right results including the end result. None of that was preordained though as I didn't fudge any of the dice throws and there were some things that could have gone differently. The game lasted 17 turns each representing somewhere around 15 to 20 minutes. The historical battle lasted around 5 hours, so, close enough. (Only about 2 hours to play but that's ok). Losses were 12 Reb stands (out of 36) and 13 Yankees (out of 48). Following the 50% guidelines and taking stands as roughly 150 men on average, thats 900 Reb and 1050 Yankees killed, wounded and missing, dropping to 750 for the Yanks in a day or so compared to 590 Yanks and 780 Rebs in the real action. So a little high but not bad. But was it fun? Engaging, exciting? Simple, well paced? I'm not sure if I would have followed the same battle plan if I had a free hand but for a scenario for someone to play the victory conditions would have to include campaign aims in some fashion incuding the need to maintain one`s own force and compell the enemy to react and there would have to be misinformation about enemy strengths and location. Then, maybe. But yes, all excited about the 1/72nd ACW again which hopefully will not distract me from the 40's. I had a few bad minutes pondering scales today but managed it to square it in my head and will stick with the 3"=100 yard. The three most pressing things are to do some Division General stands and a Corps Comander stand, mark the regimental bases by brigade and regiment for easy sorting when tired, and do casualty markers. The caps work ok for hits but I would like some record for photos of where the action was hot and it occurred to me that if I had a pool of casualty figures that could be placed when a stand is removed, I could track Army Morale by issuing the correct number by brigade at the start and then when they are gone, they are gone and no need to keep counting stands which have been removed, just to be sure. I have been beavering away at the draft of Hearts of Tin whenever I can spare a minute. At last I am ready again and have a new test game laid out. OK and 2 turns played. I'll leave readers to guess the historical battle that the game is very (VERY) loosely based on as more pictures are published. 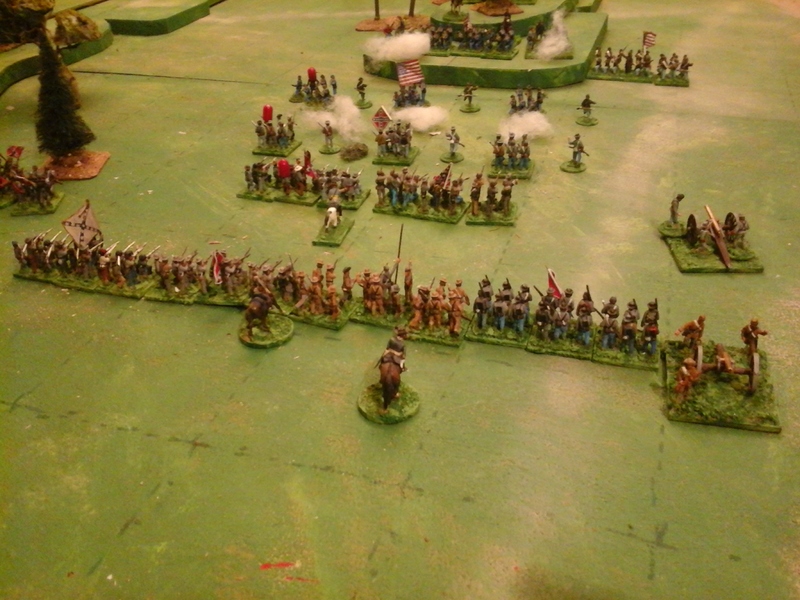 The opposing skirmish lines clash. Since even I am getting tired of the ever shifting nature of these rules, I am proceeding diligently. First I come up with clever new complicated ideas, update the draft in a hurry then remember the successful application of K.I.S.S. and go back and remove them substituting tried and true methods, sifted for consistency. For some time now the Brigade Order rule was just that if a Brigadier was given an order, he could order any or all of his units within his command radius. (3 squares, 6", 12" etc.) I've gone back to that. This means that a typical Division commander will usually only need 3 or 4 orders per turn but every now and then he will only roll a 1 and it might not be enough or his division will be scattered and hard pressed and 5 or 6 wouldn't be too many. During most of the last 10 years a group of units formed together into 1 line or column or square could be treated as 1 for movement whether using variable moves or order dice. 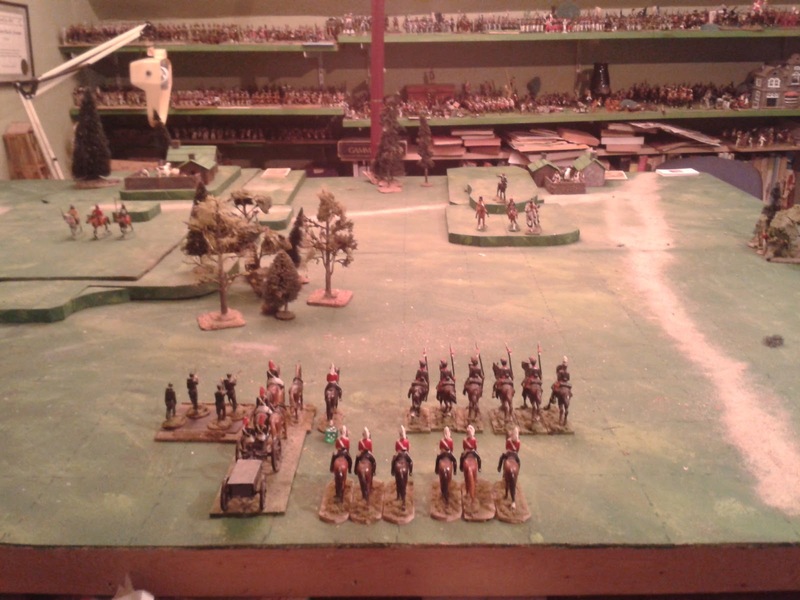 I've gone back to that as well as a way of encouraging battle lines and keeping the Brigadiers command radius low. By stopping the time line in the mid 1860's I have been able to sidestep the whole question of 1870's and later formations where all firing lines were heavy skirmish lines armed with breech loaders with integral supports a few hundred yards in the rear, under cover. That can be incorporated easily enough but the language and mechanisms to handle this plus varying earlier systems and differentiating them on table are not easy. I'll leave the later stuff for the Square Brigadier. Not that earlier practices were uniform. Skirmish lines were sometimes provided by individual light companies without coordination, sometimes by whole units assigned to the task and sometimes by detached light companies being coordinated rather than acting independently. It seems that by the 1850's it was becoming more common to send out whole units unless just deploying a thin security line which can be safely ignored at this level. That's how I originally treated skirmishers, as separate units, and I am going back to it just because the hassle of writing a simple, effective rule to handle individual, uncoordinated skirmisher stands acting as part of their parent unit is not worth the effort. So, in the picture above each brigade's skirmish line is one unit with bases spread out. Simple to handle regardless of the size of the game. In a low level skirmish, most units will be single stands anyway. Lastly, when playing I get easily confused when there is a mish mash of modifiers, numbers of dice and special cases hidden in various places so I have focused on the other main approach that I have been using since last year with the Square Brigadier. A fixed 'to hit' score for all combat with the only modifier being the rolling unit's quality. All situation modifiers are done by adapting the number of dice per stand. The game will continue on Sunday. Then I want to do some casting and painting. I have a toy soldier todo list longer than my arms which has been waiting for questions of time, place and organizaton to be settled. One of my main criteria for a set of rules for my glossy toy soldiers is the ability to handle every size and scope of game or scenario that I can envisage playing. HofT was not originally envisaged as being suitable for small war skirmishes and engagements but to my surprise during the 2009 scenario a week project, it served admirably. The games were short but fun and engaging. The set up from behind Faraway Trading Company lines. The same set up was used in both games. Obviously I also need to get back to finishing renovations and tidying. Finding myself with an unexpected hour or so yesterday, I quickly set up a version of a scenario that was published in the Courier as part of the original With MacDuff to the Frontier rules. One side consists of 2 villages which contain an objective (arms, money, rebel leader etc) represented by Aces shuffled into a stack of cards, in this case 13. Each turn a card is discarded. When the "Imperial" force captures a town, he gets all remaining cards. If he captures both aces, he wins. It is technically possible for the Imperial player to lose on the first turn but neither side knows till the end. The scenario can vary in length and number of units as desired but has equal forces with the attacker being regulars and the defender local irregulars, usually with inferior weapons though I appear to have ended up with well armed ones. While I was pondering answers to questions and comments on the previous test game, I had 2 disturbing thoughts which joined some doubts that I had during the playtest but had not had a chance to thoroughly explore. The first was that things were starting to get too complicated and detail or process vs effect oriented again, the antithesus of what the rules were meant to be and of they way they have been whenever they have worked the best. The second was that the hit points were beginning to sound like DP or disorder/disruption points, a very credible and effective idea by Alan Callahan borrowed to good effect by Simon Macdowall and which I like in theory and hate in practice. (Partly for practical reasons and partly because they make the army commander responsible for the unit commander and sergeant major's jobs). Its been tried and rejected for HofT at least twice already. The other doubts had to do with abolishing the traditional HofT melee resolution, not for the first time, and the recurring doubt about absolute reductions for cover vs probability reductions already discussed a while back. Despite all, I proceeded with the rules as written. 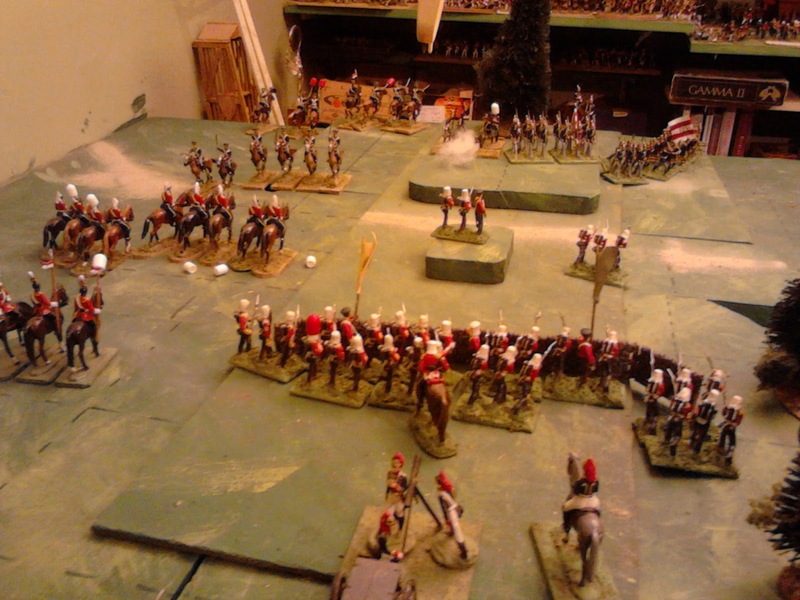 To keep this post shortish, the first game was played through to a reasonable conclusion with a draw due to a final desperate charge, the only really aggressive or risky move of the game. Both sides played very defensively, stopping to rally every hit whenever possible. This was probably realistic but dull and it probably cost the Faraway commander his chance of a decisive win since by the time he made it to one village there were few cards left and no chance to take the 2nd one. The melees were, well, odd and unsastisfying. 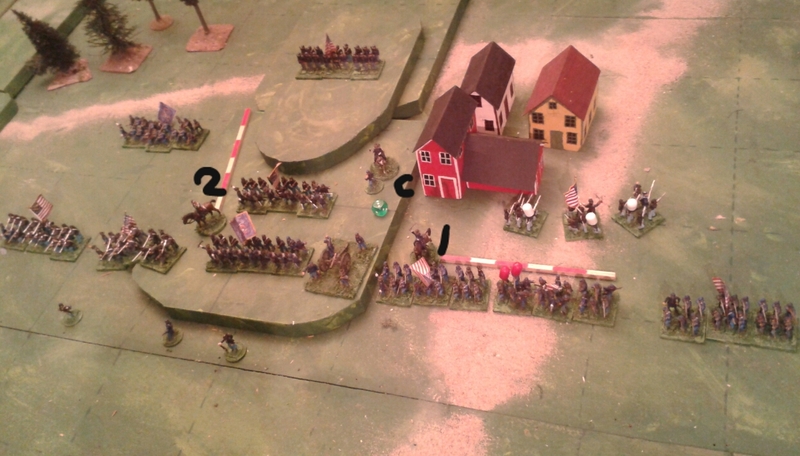 With so few dice and no possible result for cavalry other than rout by number of hits or draw, they were mostly stalemates or mutual annhilation. The larger game had had the same stalemate feel but due to numbers, no annhilations. Over all the command rules worked well except that with the sole commander being both Brigadier and General things got confusing and a bit wierd and it soon became evident that the letter of what was written was not what I had originally intended which was that a formed group of units should easier to control. Overall it was a bare pass. I could use the rules to do this sort of game if I needed a resolution for a full campaign, but it wasn't sufficiently exciting or fun to be played for its own sake. I reset and after some thought, fixed the very minor tweak to the Brigade order system since I was fiddling the ditched the whole shaken and rallying thing for the Nth time. Instead, stands come off as hits accumulate and units get weaker. But I still wanted a brake on units and have long been trying to figure out out to come up with something like the rallying rules in Charge!. So I did the previously unthought of and basically stole them except I just now realized that I missed the bit about a bigger penalty for losing. I'll fix that. At the same time I restored the usual win/lose melee rules (lacking the usual special cases which will need to be added back) and lastly, I had been trying to decide whether to use a shooting system based on the one in Square Brigadier or use the one I ended up trying which worked OK in most situations. Since I wasn't enthusiastic about it and was making changes anyway I decided to give the other system a chance. At this point my time was up but I overruled life and came back up after supper to play again, at least for a turn or two. 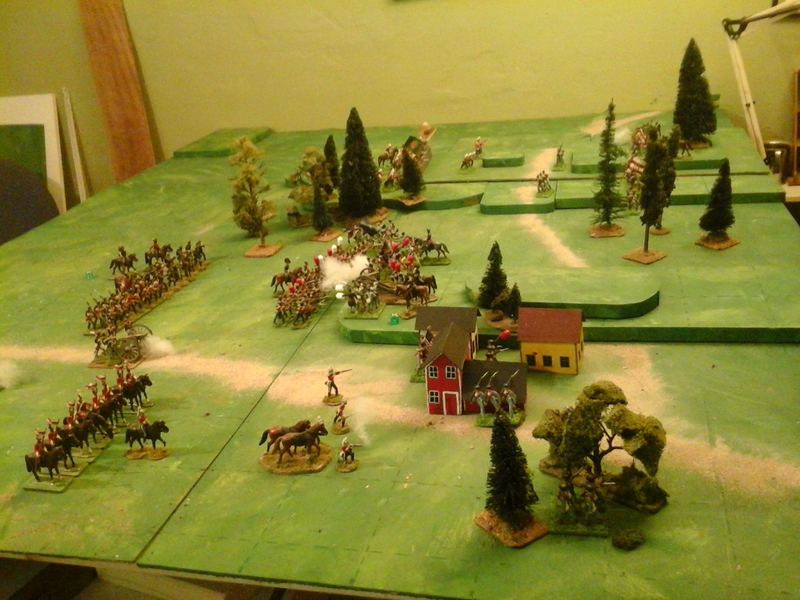 The Lancers seaarch the burning ruins of the farm while the rest of the force presses the remaining natives. This time the pace was faster, things happened and the differences between troop types and tactical options seemed clearer. 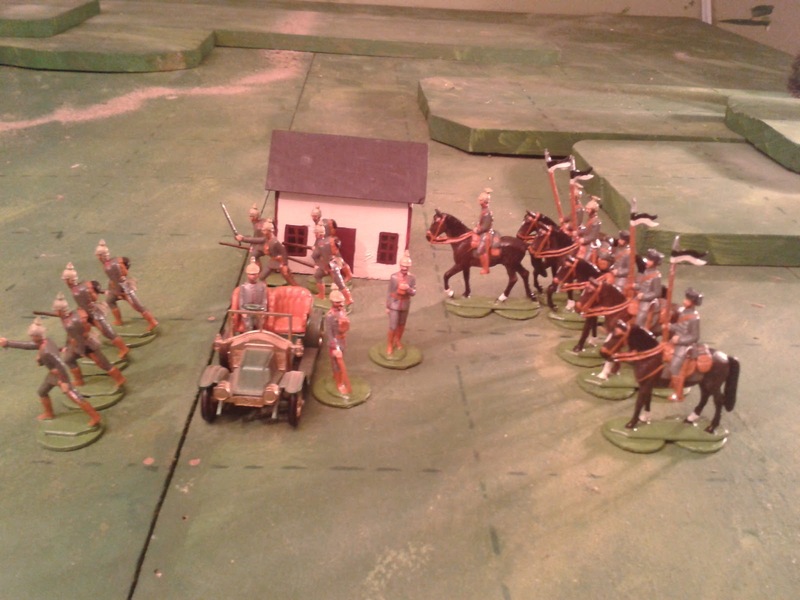 The regular cavalry soon became a serious threat but started to be worn down by a trickle of casualties, some gotten while winning melees, others from fire by infantry in cover while the cavalry was rallying. The rallying ate up time and made it tempting to use reserve squadrons to keep up the pace but hovering enemy made that seem rash. At last the irregulars were up against the edge of the table with only 1 hit remaining. In went the charge against enemy plus general and up they came with 3 x6's. OUCH! Both sides wiped out. OH well, It was balanced by a sudden burst of accuracy by the rockets which cleared one village. Alas it was already emptied of all signs of wrong doing as was the other one by the time it was searched. This had been been a fast paced and exciting game though. Now to try it with larger forces. Sunday is the target. Newsflash: The Black Fox has returned! We interrupt your scheduled post on Atlantican history and culture to report that the Black Fox has been seen and is being accused by officials of the Faraway Trading Company of encouraging resistance to tax collectors. Reports of a clash between company troops and members of the Bretheran indicate that casualties were heavy for both troops and rules. Details to follow. Now that I've taken time off to deal with the storm formerly known as Hurricaine Arthur including a 40 hour power outage, its time for several blog posts. The one about geography, grass roofs and large goats in Atlantica can wait, today's post is by request. 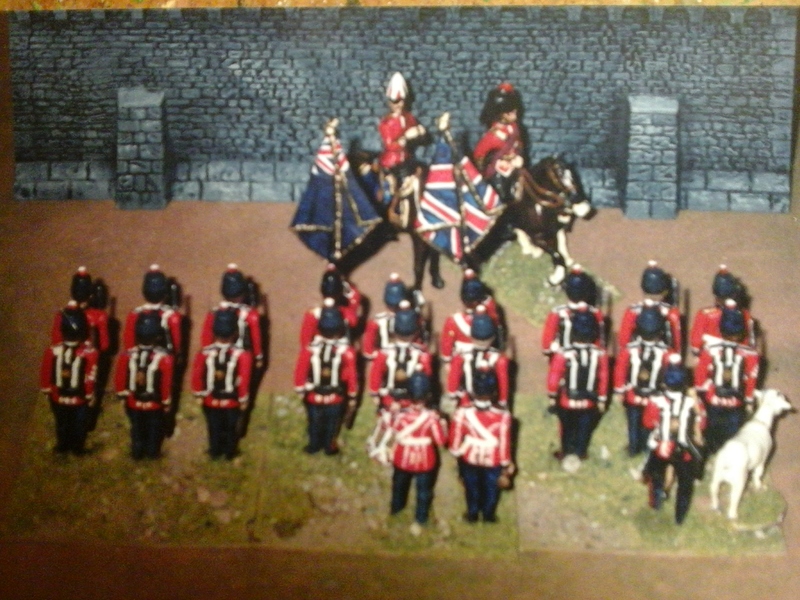 A Division of 1/72 Union Infantry. The sticks are 6" long. The White caps indicate Shaken stands, the Red caps indicate hits, in this case caused when the other unit routed through them. Please note that the following comments apply to a draft in the middle of being tested and some of the details are no longer valid. I received a question about how the command rules work and thought that an example with picture was the best way to answer. 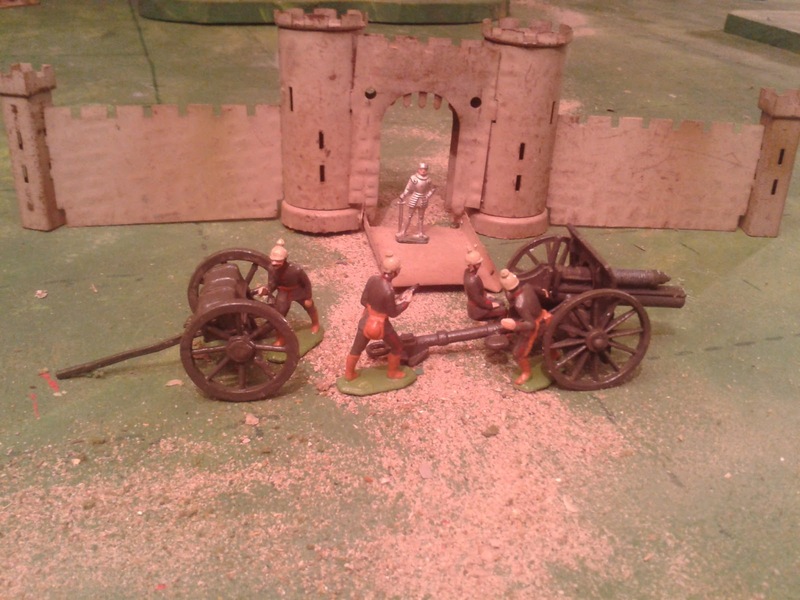 Here we see a Union division with general (C) and 2 brigadiers (1 & 2) and a battery of guns. The picture editing on my tablet is a little basic and this is the first time I have used it so no fancy arrows or even unit labels. Hopefully this will suffice. The Division Commander has just rolled 3 Orders. The battery is in position to fire so may be left to do so without using an order. The first brigade has a broken unit which needs to be rallied either now or soon. It has 3 units in a Brigade line. The 3rd unit is beyond the Brigade commander's 6" radius but is part of a Brigade line (technically the rules say touching but that is close enough for me, I should amend that to a base width) so may be included in a Brigade Order to move while maintaining their current alignment and facing. Since orders do not have to be applied to all units in a Brigade line the unit with 2 hits could be ordered to rally or the end unit ordered to close the gap, or both if 2 orders were used. The second brigade has 5 units 3 in a line (base width apart) and 2 at various distances behind but all within 6" of the Brigadier. The entire 2nd Brigade could be ordered to move on a single order since all are within 6" but would have to maintain this scattered formation. Individual orders could be issued to units to move up into a tighter formation. Last but not least if the 3 orders are not enough to allow the Division General (aka the player) to do everything, either he or the 1st Brigade Commander could ride over to join the broken unit and rally it in person without using an order but that would leave the Brigadier too far from his Brigade next turn to issue a brigade order and there is a risk, admittedly small, that a commander can be swept away by a rout. Well here we are, the 4th anniversary of my 'little incident'. There is no sign of an imminent repeat performance but in preparation for this day I have just added anemic to diabetic, vitamin B deficient and heart attack survivor. Despite this, my good days are better and more frequent this year and I am excited about my wargaming and toy soldier plans for this year. Theoeretically this is where I should present my plans for the year ahead but I did that in a post in April and the only development is that I have decided that my glossy old style 40mm "imagi-nation" Atlantica games will return to roots using Hearts of Tin with troops mounted on bases and not become a revisit of MacDuff's colonial engagements with the Emir of Wadi Foulyam. Its a little unsettling to see that the list of on going periods continues to shrink and that there is a shortage of exciting new sideshows to be abandoned unfinished but its also a little comforting. 2009. 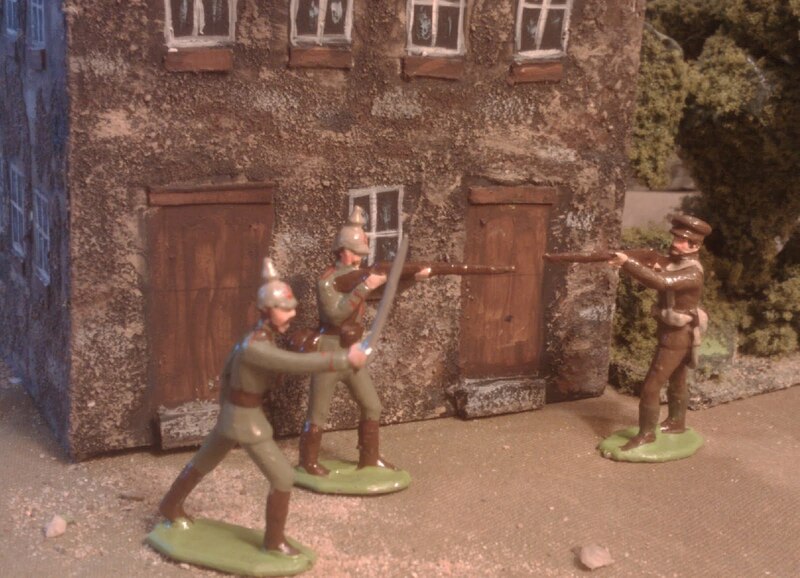 Faraway troops assaulting a Bretheran of the Coast stronghold. On Tuesday I managed to play through the development/test game and Hooray!, I seem to have finally solved the rule mechanic conundrum that has been dogging me for a decade. Its not the first time I've felt that so I'm tempering my expectations but it looks good. I'll let the picture captions sumamrize game events and talk a bit about game mechanics and theory. Mid Game. An initial attack on Blue's position was repulsed after heavy casualties but a follow up attack by the elite Royal Fusiliers drove Zinn's brigade off the hill. 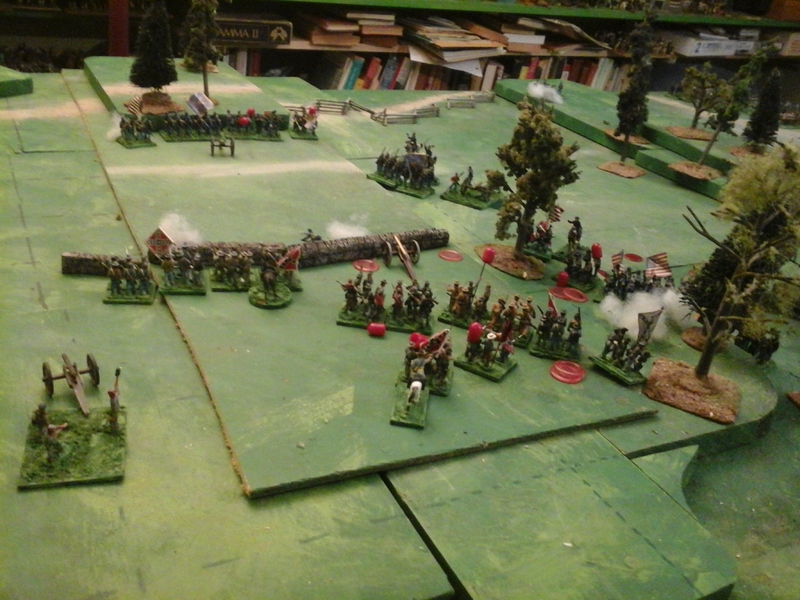 The appearance of the Blue Dragoons on the opposite flank caused an order to the DGBG and Horse Artillery to rapidly switch to the left flank. For this game I reverted to the Pips version that I have been using for 2 years now which is also similar to the Square Brigadier version and again it worked well. The combat system makes two assumptions. The first is that long range fire by 19thC infantry was largely fire by skirmishers who would close to effective range but could be massed fire. Either way, such fire could cause a trickle of casualties but did not usually stop a determined attack. If neither side pressed home a serious attack, such a firefight could go on all day. In a very slight variation of my usual rules I measured long range shooting from the main battleline and counted stands ther even if the unit had skirmishers deployed. This was partly for ease of play and partly to reflect that the fire of a small number of skirmishers at effective range was usually at least as effective as the fire of whole battalions at long range so using this mechanism provides consistancy of game mechanic while getting the same result either way. Units without a skirmish screen are however, more vulnerable to small arms. Close range fire on the other hand can be not only bloody but rapidly decisive. This has always been my premise behind adopting Morschauser's 3" Melee range. Not having a way to diferentiate between firefights and charges with cold steel always bothered me so I have played with many variations over the years to let me do that effectively. The latest tweak to the morale system and a variation on an experiment 2 years ago that did away with a separate melee resolution rule seems to have finally cracked it. Essentially long range fire is done instead of moving but does not require an order once the unit is in place. Units get 1 die per stand. If a unit closes to within 3" both sides shoot with 2 dice per stand during each player's turn unless 1 side charges into contact. Charging units take any losses from fire then roll their dice but get 3 dice per stand. If neither side breaks a 2nd round is fought by units in contact only, this being 2 dice per side and simultaneous. If neither side is broken any unit that charged or couter charged will retreat out of contact or if desired an inch back to continue a firefight if infantry. Zinn's Brigade fought hard but outnumbered and outgunned it was eventually driven off the table and the Queen's Third Brigade turned its attention to the Blue guards leaving the 2nd to clean up. The morale system is, as usual, the Heart of the rules. Here the premise, greatly influenced by Ardant du Picq when I was in college, is that units in battle suffer a loss of effectiveness from loss of discipline over and above any casualties suffered, not to mention fatigue and running out of ammunition. Studying various battles led me to conclude that often units that were defeated could rally and come back, but not always and in some cases units are routed or so badly shot up that they are forced to retreat off the field. The Storyteller wants to know the details but on the day the General just needs to know which units are functioning, which are not and which are in danger. Getting this balance right has been THE difficulty over the last 10 years. I had many solutions which looked good in theory but failed in practice. I wanted something easy to administer in a large game but robust enough for very small games. It had to handle a trickle of casualties one way and heavy losses another, not need a cheat sheet or require consulting charts or rosters. It need to allow some units sometimes to rally, but only in the right circumstances and those circumstances had to be clear to players (failed that several times by getting too fancy/fussy) and it had to ensure that most units did not become immortal (another frequent problem). It also had to reflect that good troops were able to push on through heavier fire and greater danger than poorly disciplined ones and be more likely to rally and be capable of a credible second go but not guaranteed of it. The basic mechanism of combat causing hits and eventually causing stands to be removed if they weren't rallied off came early on and appears in the initial 2003 version. Fine tuning it has been torturous and was one of the major factors in trying out a single figure version of the rules. By halfway through the game I had tried several minor tweaks and all of a sudden stumbled on an easy logical answer that appears to deliver all the things I've been trying to get it to do. Nothing here was new but the specific combination of the various possibilities was a slightly different combination. So, the current version goes like this, regular troops can take 3 hits per stand (elites 4, poor 2). When a unit accumulates that many hits 1 stand is shaken and gets no dice in combat. When all stands are shaken the unit is broken and will retreat each turn until rallied or it leaves the table. If the unit is not within 3" of the enemy (melee/close range) then it may be given a Rally order (if the general has enough orders to spare one, it can be a problem if too many break at once). When a unit rallies (which can be done anytime, not just when a unit is broken) the player rolls 1 die per hit needing 5,6 to remove the hit (+1 for elites etc). Any hits not rallied are applied to the unit again but this time any shaken stands are removed from the game. The result is if a unit takes very heavy fire it can collapse quickly, especially if poor. In theory it can also rally to 100% but it is unlikely and it is also possible that even the best units may not rally one hit. Fear of unlikely events was one of several persistent issues that I finally overcame by unclenching. Of such wierd chance events are good stories made. Since a unit does not have to wait, ideally it should rally often except that it can't shoot or move and rally and orders are limited and rallying uses one. So if the defender is tickled with long range fire but not pressed so that he has to move, he can sit back and rally but a heavy bombardment followed by attacks pressed home and supported or repeated by ready reserves with the minimum respite, cracks are likely to appear. Effective defensive fire can give the attacker a tough choice, halt and try to rally or press on and risk breaking. It also means that poor troops are best off going for a simultaneous but less effective firefight than pressing through the enemy's fire and closing with cold steel which is the job of grenadiers or heavy cavalry. 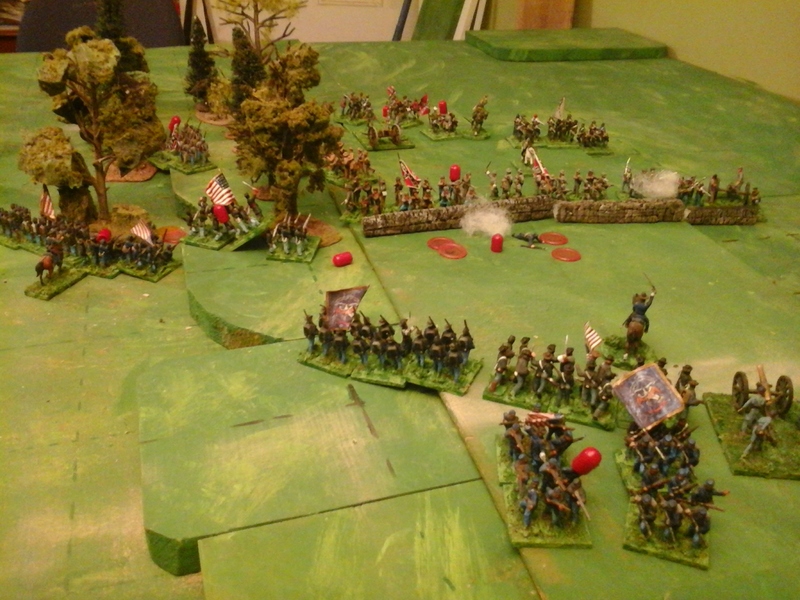 On the left, Charge followed charge with heavy losses to both sides but eventually the Blue Dragoons broke and the remnants of the Blue army was forced to withdraw. The rules have been updated to what was played for the last 2/3 of the game. They can be downloaded from the link at left or here. Will this be the definitive version? Or will I find a new flaw? Hopefull this will be it once I add some additional troop types and make sure all the little odd things are covered like an engineer officer trying to blow in a hillfort gate, escalading, amphibious assaults and special units and unusual tactics like mounted fire by Native Atlantican cavalry and so on. I decided to keep the rules to the War of 1812 up to the ACW but it would be easy to back date them or to expand them to at least the Franco Prussian war if not further. But for now its back to finishing renos and clean up of my games room and to sculpting, casting and painting 1850's figures and filling out the backstory. Bob Cordery has unwittingly cracked my North Atlantican architecture, culture and economic basis mystery but that's another post. I'm glad I tried that. It took 2 full turns to remember why I had dropped the Variable Moves. Its fine with a small game but in a larger battle with 20 or 30 units aside, there is alot of time and mental effort spent just handling the mechanics of moving. There was also a minor issue about the army commander being too focused on the details of handling individual brigades but a rule allowing formed brigades to move as 1 unit would fix that. The feel of reacting to circumstances rather than driving them would be harder to beat. The first assault on the hill hangs in the balance. The revised sequence of play was ok but not Hearts of Tin. So, I reset and started over with the familiar sequence and most common mechanisms from the last 9 years without writing anything down. 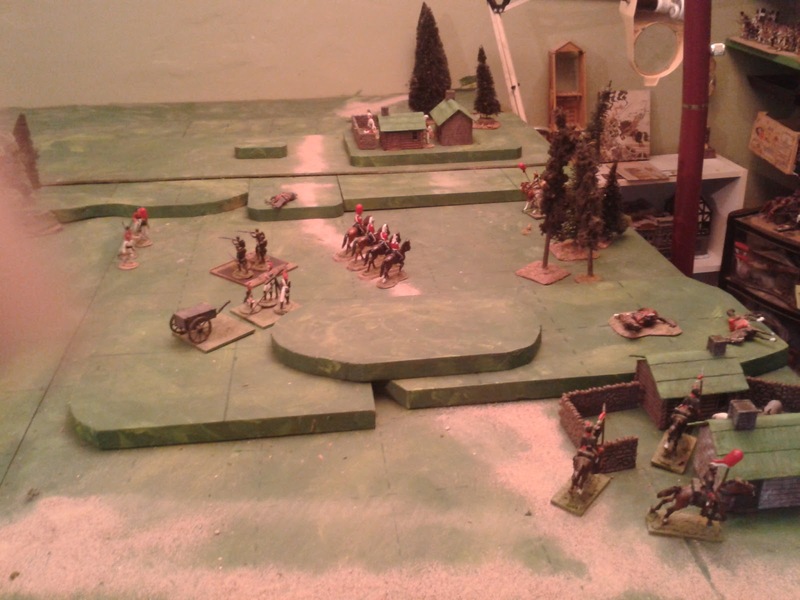 Order dice, move or shoot (skirmisher fire and artillery) or rally, 3" mutual combat zone, hits and rallies. No thinking about theory, just doing what came naturally (ie habit) felt good. After about 7 turns I broke for lunch in an air conditioned room and started making notes. The game will resume when the temperature upstairs abates.